The frantic voice-over, the constant bombardment of tracking shots mixed with sporadic cutting, the amazing use of rock music- all of the staples from Scorsese’s signature crime films are here. With his previous two features, The Fighter and last year’s Silver Linings Playbook, Russell tackled two very different genres (boxing movie and romantic comedy) in his own consistently thrilling and fresh way. Although American Hustle is a much more complicated and sleek film, it feels like a step backward of sorts simply because its stylistic influence is blatant and overused. It even plays rough and rowdy with history and the time period the same way that Scorsese does in movies like Goodfellas. Turning the Abscam corruption sting case from the late ’70s and early ’80s into such a wildly funny and drugged-out con job makes it decidedly less self-serious then a true life government operation movie like, say, Argo. It barely shows the congressmen caught up in the mob corruption, but rather the push and pull of the government agents and the criminals they enlist (entrap) to help them. Everyone in this movie is stupid in their own way, except maybe Amy Adams’ character, who is just unlucky. She is the one who takes the fraudulent money from an FBI agent (Bradley Cooper), which in turn pulls Rosenfeld, her lover, in to help fry bigger fish. Rosenfeld is a repulsive slob in the beginning of the movie, and is only sympathetic when it becomes clear to him that everyone is just as crooked as him. The government “good guys” are basically running a post-Watergate publicity stunt and one of the “bad guys,” Camden, New Jersey mayor Carmine Polito (Jeremy Renner), has a dimwitted, illegal way of trying to jump-start a sluggish economy. As it becomes clear that everyone in the movie is, in their way, conning someone, Rosenfeld starts to feel the burn as the net they are casting continues to widen and involve much bigger fish. He is matched blow for blow in hairdo grotesqueness by Cooper’s agent Richie DiMaso, a perversely ambitious hothead and drug addict. Both of these performances feel slimy, and both actors capture the disingenuous core of each of the men. Russell has a way of bottling a unique kind of lightning from this very diverse group of performers, which in addition to Adams and Renner also includes an explosive turn by Jennifer Lawrence. As Rosenfeld’s wife, she reveals herself to be the biggest manipulator of the bunch even though she has no initial involvement in the caper. That is the point Russell seems to be getting at. 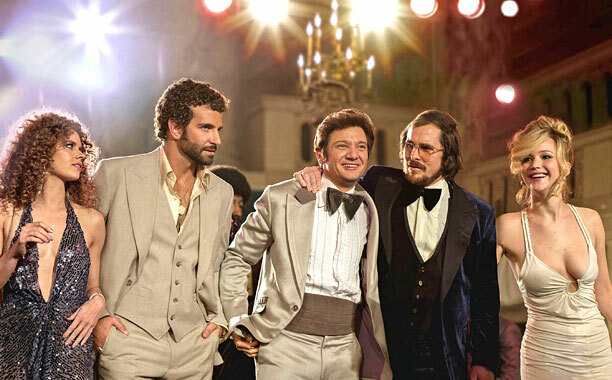 Tacking a grandiose and vague title like American Hustle onto the story means he’s showing us that all Americans are hustlers, whether they’re in front of the camera, behind it or watching the final product in a theater. The movie is almost aggressively sloppy, diluting this simple theme well past two hours. Even when it’s redundant it’s never dull, though as far as self-conscious Scorsese knockoffs go, I’m still partial to Boogie Nights. This entry was posted in Reviews and tagged 2013 movies, 2013 Oscars, American Hustle, American Hustle movie, American Hustle review, Amy Adams, Annapurna Pictures, Best performances of 2013, Bradley Cooper, Christian Bale, David O. Russell, Jennifer Lawrence, Jeremy Renner, Louis C.K., Megan Ellison, Robert DeNiro, Silver Linings Playbook by matterspamer. Bookmark the permalink. American Hustle isn’t my usual genre of movie, although I am open-minded, but I am tempted to see it simply because I love Silver Linings Playbook and I think Jennifer Lawrence is a fantastic actress. She plays a very similar character but isn’t in it as much, so take that for what you will.